NPR's All Things Considered story entitled Bike Infrastructure Hits Congressional Speed Bumps includes an interview with Andy Clarke of the League of American Bicyclists. "If we were in Portland or Amsterdam ... we'd have our own set of traffic signals, and there'd be a little more space here," he says, "but, you know, these are early days, and we're not Amsterdam yet. We don't have quite that many cyclists, but it's certainly noticeable the increase in the last year or two as the infrastructure has gone in." Another article in the Post: Pedicabs and exercise: That’s how we roll. Pedicab drivers, like their renegade cousins, bike messengers , burn countless calories cycling, one of the most healthful forms of exercise we know. They work outdoors. They work for themselves. They set their own hours. A hustling driver can cover 25 or 30 miles in an eight-hour day, earning about $200 and staying pretty darn fit in the process. 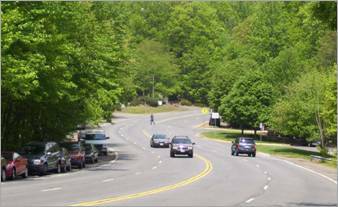 Earlier this spring VDOT held a public meeting to discuss a possible road diet on a mile and a half of Soapstone Dr in Reston. The project will be implemented next month. The first of 8 regional meetings as part of the countywide bicycle master plan to gather information from local cyclists. 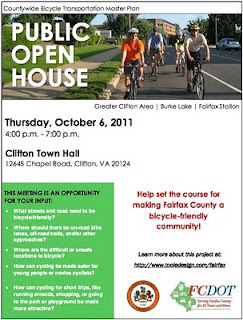 It will be held on October 6 from 4-7 p.m. at Clifton Town Hall, 12645 Chapel Road, Clifton, VA. 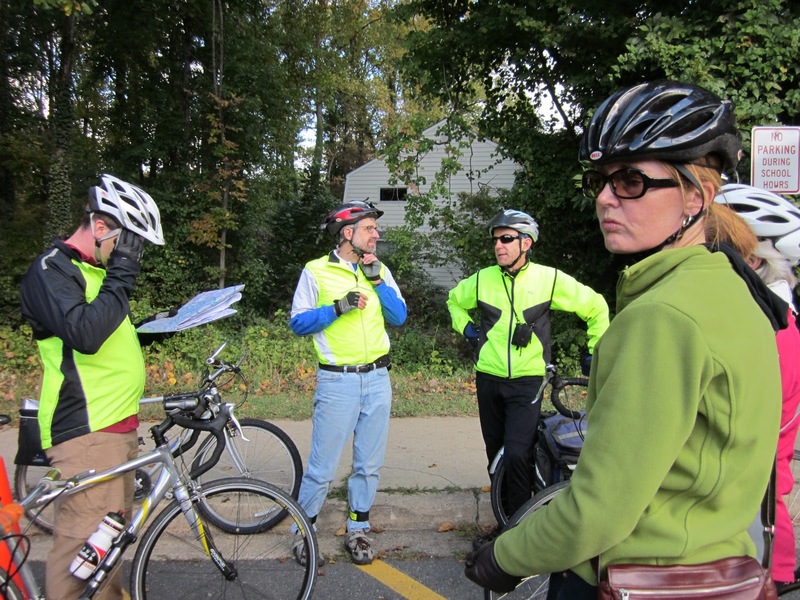 This is a chance for cyclists knowledgeable about riding conditions in this area to let the county bike planners know what is needed to make the area more bike-friendly. See a copy of the Clifton Area meeting flier. What streets and road need to be bicycle-friendly? Where should there be on-road bike lanes, off-road trails, and/or other approaches? Where are the difficult or unsafe locations to bicycle? How can cycling be made safer for young people or novice cyclists? How can cycling for short trips, like running errands, shopping, or going to the park or playground be made more attractive? Congratulations to Richmond on being selected as the host city for the 2015 UCI Road World Cycling Championships. According to the news release from Governor McDonnell's office, the event "is projected to generate more than $86 million within the City of Richmond and a total of $135 million for the entire Commonwealth. 500,000 spectators are expected to attend the nine-day event, with another 300 million tuning in to watch from all across the world." See the Virginia Bicycling Federation post that includes links to several news articles about the selection. International Walk (and Bike) to School Day is on Wednesday, October 5. For the first time Fairfax Co Public Schools are celebrating the event by encouraging kids and parents to walk and bike to school on this day. The school system announced the event with a news release yesterday entitled FCPS Students to Participate in International Walk to School Day. There's also a Walk to School Day web page on the school site with links to FABB, WABA, and Trails for Youth, the coalition of groups that has been working with the school system to gain support for walking and biking to school. Thanks to Jeff Anderson of FABB whose kids attend Wolftrap Elementary School. He has taken the lead on this effort, getting support from various school groups, and working closely with school staff to help spread the word. See the list of schools in Virginia that are participating this year. At last night's WABA Annual Member's Meeting Fionnuala Quinn, vice-chair of FABB, received WABA's Bicycle Advocacy Award for 2011. Congratulations Fionnuala! 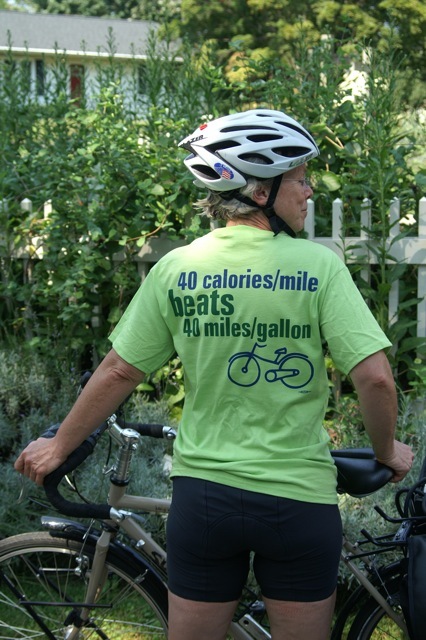 The award is well-deserved for all of the hard work she has done with FABB and as the primary author of the Guide for Reviewing Public Road Design and Bicycling Accommodations for Virginia Bicycling Advocates. Fionnuala also was a major force behind the Women Cycling Project. The Guide has been well-received locally, regionally and nationally. Earlier this year FABB received the Alliance for Biking and Walking 2011 Alliance Advocacy Award for producing the Guide. Over 13,000 women responded to the Survey on Women Cycling for Transportation, part of the Women in Cycling Project, and several reports have been written based on the survey. Fionnuala also gave the keynote address at last night's meeting in which she discussed the Guide and the Women Cycling Project. She stressed that "good design costs the same as bad design" so why not ensure that our roads are designed for all road users. She also discussed the importance of creating riding conditions so that more women feel comfortable using bicycles for transportation. WABA members are encouraged to sign up for the WABA Annual meeting to be held on Monday evening starting at 6:30pm. Join WABA staff and Board of Directors as we take time to reflect on our work in the past year and plan for the year ahead. The evening will include elections for the Board of Directors, presentations by WABA staff, and awards for local advocates and volunteers. Light food and drinks will be served. As a member of WABA, you are welcome and encouraged to attend the annual meeting! To help us better prepare for the evening, please RSVP. This Saturday, September 24 there will be a "rally to cut our dependence on oil & save tax dollars. Tell Governor McDonnell we want the choice to move beyond oil - to walk on sidewalks, bike on bike facilities, and use transit. 10-noon at Dunn Loring Park, 2540 Gallows Rd, Vienna, VA, just south of the W&OD Trail. First 40 people get a free t-shirt (see photo at right). The group will walk from the park to Dunn Loring Metro. For more information contact Linda Burchfiel at linda@lburchfiel.com, 703-506-4310. 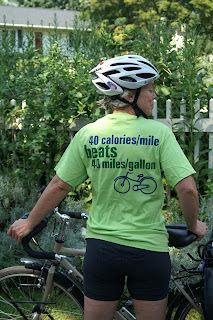 Sponsored by 350.org, Smart Growth America; Fairfax Advocates for Better Bicycling; Sierra Club." Visit the Sierra Club website to sign up. WashCycle reports on a cyclist who was struck while crossing Lynn St on the Custis Trail in Arlington. The light was green and the cyclist crossed in the crosswalk and was struck by a motorist turning onto Lynn St. There is, of course, no highway sign there. The officer told him that the painted stop sign on the pavement was the "highway sign" in question. The MUTCD does not appear to cover how to treat the word "STOP" painted on the pavement. The police officer also told him that he was considered a “cyclist” while on the trail, but became a “vehicle” when he entered the intersection, and thus did not have the right-of-way to oncoming traffic. Which is wrong, because he's always a cyclist - even in the road - and he was actually on the trail, even though he was in the road. Do pedestrians crossing in an identical way become vehicles when they cross? The identity of the cyclist who was struck at the intersection of Great Falls St. and the W&OD Bike Trail Thursday afternoon was released by the City of Falls Church yesterday. He is David Fournelle of Reston, Virginia. He was treated and released last night at a local hospital. Falls Church Police cited him for Disregarding a Stop Sign. The identity of the driver whose car was involved in the collision was not released. This first appeared on ArlNow. We reported earlier that VDOT has recommended a review of VA Code as it relates to these situations. A cursory review of the Code language in this study suggested that trail users on multiuse pathways may not be obligated to comply with non-signalized traffic control devices where the trail intersects a roadway. In addition, the research found there is confusion among motorists and trail users about right-of-way laws regarding the W&OD Trail where a STOP sign is directed toward the trail users. This confusion could compromise safety at these and other similar multiuse trail/roadway intersections. It's time that this situation is clarified. Police seem to have an entirely wrong interpretation of the situation in which there is a non-VDOT stop sign at a crosswalk, and cyclists are paying a steep price. We don't often write about biking in Montgomery Co but this map of biking hot spots that we saw on Greater Greater Washington recently got our attention. "The map was developed by measuring proximity to trip attractors such as Metro stations and public facilities. Density and the mix of land uses also factored into the analysis." 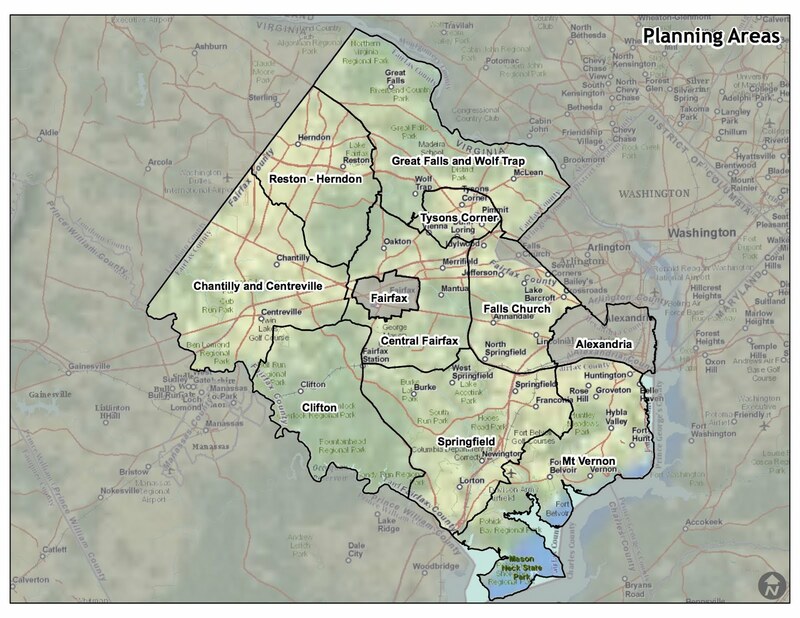 Fairfax Co is undergoing their first ever bicycle master planning process for the entire county and this type of map would be very useful for prioritizing funding for bike projects. 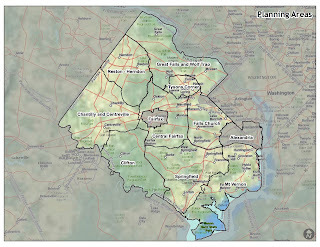 Fairfax is similar to Montgomery Co in many ways, with large relatively undeveloped areas surrounding more dense areas served by Metrorail and frequent bus service. With nine magisterial districts, there is often the tendency to allocate funding equally among districts. That approach is challenged when viewing a bicycle heat map, which indicates areas that will benefit the greatest from limited funding. At the second bicycle advisory committee (BAC) meeting for the county bicycle master plan, the plan consultant, Toole Design Group, announced the release of the public website for the Countywide Bicycle Transportation Plan for Fairfax County. Information about the upcoming geographic area meetings will be announced on the Meeting Schedule page once that information is finalized. The first meeting will cover the Clifton area and is tentatively scheduled for September 27, location TBD. As you can imagine, scheduling 8 geographic meetings and 6 thematic meetings will be a major challenge. The presentation from the BAC meeting will also be posted on the new website. During the meeting we discussed an online mapping tool developed by the other consultant, Cambridge Systematics, to allow BAC members to comment on proposed bike facilities. 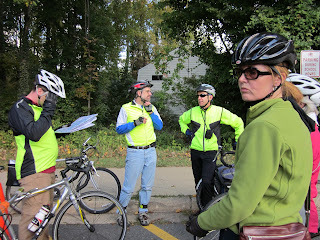 During the Tysons bike planning process cyclists had access to a similar tool, Community Walk, to provide their input. It's not clear yet whether that tool will be available again for the countywide process. We also discussed goals for the plan. There was consensus that we need to spend the time necessary to ensure that we have a process for identifying the major goals and a plan for implementing them. To be effective, it will require a commitment of resources from county officials to implement the identified goals. Given the current lack of resources and the challenge of working with VDOT, which controls most roads in the county, it's important that this commitment be stated early in the process. Check the new Countywide Bicycle Transportation Plan website for additional info.